I assume the intended point is that there’s a lot of white liberal backslapping about living in an area with an unusually high level of non-white minorities. On the other hand, neighborhoods like Riverwest are admirable in that they buck the national trend of “socially enforced apartheid” where an 8-19% black population constitutes the “tipping point” at which white residents will leave in droves. This phenomena of white flight has been the driving force behind the radical economic disparity between the city and its suburbs. It’s a good thing that it’s mostly a relic of the past in Riverwest. Nevertheless, our demographic diversity is one thing on paper and another thing altogether in lived reality. Do Riverwesters merely tolerate racially mixed blocks without there being a real multi-racial community where people socialize and engage in commercial activity that is not viewed (and thus segregated) as white, black or latino? Where does that public and private mixing happen or fail to happen? Why? Does it matter? This issue of the Riverwest Currents is unusual for the amount of reflection that many of the articles undertake regarding questions like these and related aspects of Riverwest and Milwaukee culture. Jeff Johnson writes about the storefront churches along Holton Street and the spiritual and material forces that might explain their reasons for being. In another article, he reports on Dr. Jill Florence Lackey’s presentation of the stories of homeless people in Milwaukee, many of whom have camped out along the river near the Locust Street bridge. 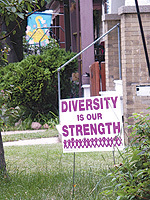 Others reflect on what “diversity” really means in Riverwest. Suzanne Zipperer and Tanya Cromartie Twaddle dialogue about that question, and one observation they make is that community projects tend to be initiated by white residents in ways that can seem too pre-planned, regimented, and stiffly scripted to leave room for what Tanya sees as a more intuitive, free-flowing and differently structured African American form of community organizing and participation. These generalizations are debatable, but whatever truth they may hold, people are not bound absolutely by their cultures and histories, nor are differences necessarily barriers, as Dr. Lackey concludes in an interview concerning her work with Urban Anthropology. Based on these articles and other items in this issue of the Riverwest Currents, I wonder what a cultural anthropologist might conclude about Riverwest today. She might look at the debate about David Middlebrook’s sculpture in Gordon Park. Does Middlebrook’s iconic tribute to older, ethnic cultures in Riverwest suggest a nostalgia for them, or simply the absence of communities where membership and identity is given to people by birth? Does our ability to choose membership and identity, to make what we will of the past, characterize us as a fragile community whose identity and unity is never certain and is always open to change? If so, is that freedom a gift or a curse – or both? A cultural anthropologist might also note the debates in the Riverwest Neighborhood Association and on the Riverwest e-mail network over Jewel Osco’s attempt to procure a liquor license for its store on North and Humbolt. She might look at Judy’s Red Hots’ proposal to extend its hours at its location on Holton, and the responses of near neighbors and others to that establishment’s perceived noise and litter problems. These debates resonate with the tensions Tanya and Suzanne discuss. The legitimate desire to protect, sustain and nurture the health of a community is hard to distinguish from an overly fearful and reactive assertion of control. Now more than in the past, people may choose and define their own communities, but they must belong to them; no one person or group can make their community belong to them, exist on their terms or in their own image exclusively. So the question is always there: how much self-assertion and control is too much? It doesn’t take an anthropologist to see that this concern is a common, practical one in Riverwest, though it is apparently not so common elsewhere in our cities and nation today. Some might wish for mythical times and pristine lands where such problems do not present themselves and they can “have it their way” all the time. Others might wish for a society that exercises great caution when it comes to making decisions that affect others’ lives and livelihoods. You may hear both wishes expressed here in Riverwest, maybe by the same person, and maybe by you.